The Road to Hana is TOPS on my list of activities you need to incorporate to your itinerary when visiting Maui! It’s one of best ways to see the beauty and diversity the entire island has to offer. From the small hippie town of Paia to the breathtaking views, amazing beaches, cool pit stops, and activities this remote side of the island offers, the road trip to Hana will be one of the highlights of your trip! Without stopping, the trip from Paia to Hana is about two hours long, but of course we wanted to stop and enjoy some of the activities along the way, so we set aside an entire day for the trip. P.S - Estimate taking around (2-5 hrs) to make it to Hana if you choose to stop along the way. If you only have one day to spare (like in our case), you can definitely see a lot and pick which of the activities listed below you prefer doing. We rented a Jeep Wrangler on the west side of Maui (Kaanapali) and headed out on our adventure very early in the morning (5am to be exact). 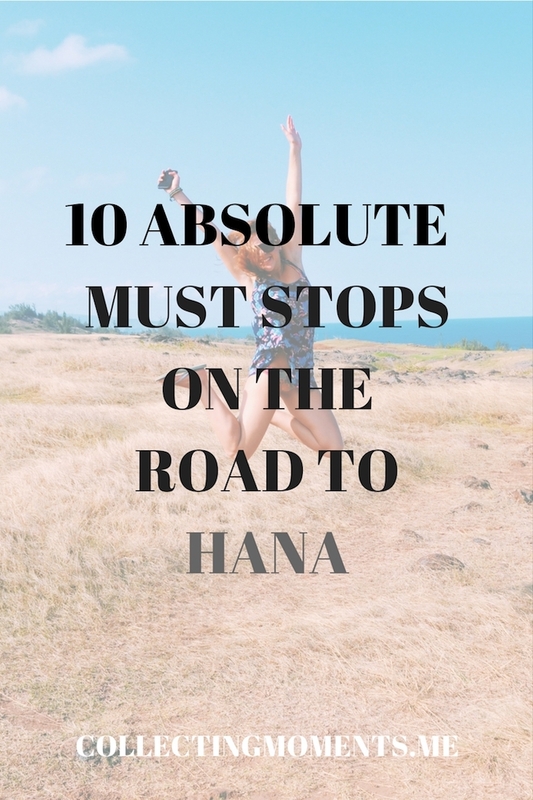 We enjoyed most of the activities on the list (we ran out of time to see everything), but honestly, if you can manage to stay for at least one night in Hana, you will be able to enjoy everything on the east side with no rush. 1. Paia – As I mentioned on my guide to Maui, Paia is a hippie town in the northern coast of the island and the last town before heading on your adventure to Hana. The town has a few blocks of local restaurants and boutiques and is perfect to stop for breakfast and load up on carbs to start the day off right. 2. Ho’okipa /Jaws – We obviously had to stop here since we are both into surfing! Both spots are famous surf/windsurfing breaks and a great stop to see some local and major athletes ripping. 3. Twin Falls – We didn’t have a chance to stop here, but I highly encourage others to do so. They are the first easily accessible waterfalls and pools on the road to Hana and a fun and refreshing way to start your trip. 4. Island Chef – We stopped here to eat and loved it. It’s a bunch of shacks off the road where you can grab a smoothie, some tacos from Island Chef, or some Thai food. It has a very rugged appearance (but don’t judge it), as it’s just so perfect to eat in a place so remote, and it’s a great part of the experience of the road trip. 5. Pa’iloa Beach — It’s a small beach characterized by its black sand made by lava pebbles and the contrasting blue ocean water. 6. Kaihalulu Beach – Beach characterized by its red sand made by rock lava. In order to get to this beach, there is a hike that shouldn’t be made by anyone afraid of heights! 7. Pipiwai trail to Waimoku Falls – Amazing, must-do hike! It’s around 4 miles (roundtrip) and can take from 2-3 hours to complete. Parking was $10 at the Haleakala National Park Visitors Center, and the hike was not very difficult, but do make sure to wear appropriate shoes! It is very well maintained, and you get to see an amazing Banyan tree, cool views, go through a BEAUTIFUL bamboo forest, and finally make it all the way to Waimoku Falls! 8. ‘Ohe’o Gulch – These are the fresh water pools (also referred to as the Seven Sacred Pools) you can find once you have enjoyed the Pipiwai hike. They are easily accessible, so head down to the fresh water pools (there are more than seven!) and relax! 9. Hamoa Beach – This beautiful beach in Hana is named one of the top beaches in Maui and is perfect to spend the day. There are public restrooms and showers. 10. Hana Farms – On our way back to Kaanapali, we made sure to stop at Hana Farms and enjoy some delicious banana bread. We got the chocolate-chip banana bread (it was out of this world!) and some ginger soda. We loved it here! They had all types of banana breads, fruits, sodas, and on the weekends, wood oven pizzas. There you have it! Hope this helps when planning your Road to Hana adventure!